Venison meat on a cutting board with herbs and spices. 2 What Are the Dangers of Eating Venison? 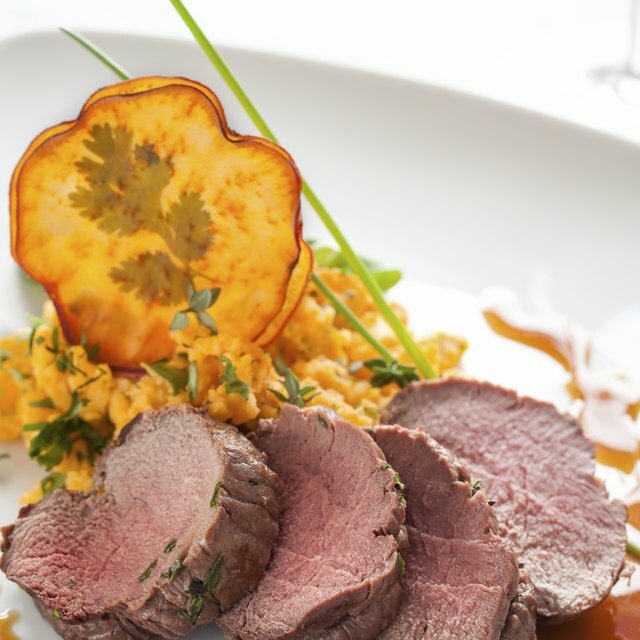 Deer meat, known culinarily as venison, requires a bit of work to bring out the best flavor. Soaking the lean meat in a marinade relaxes the proteins and adds flavor. Smoking makes the meat even more tender and gives it a rich flavor that eliminates the “wild” or “gamey” flavor often associated with deer meat. A light marinade of olive oil, balsamic vinegar, Worcestershire sauce and spices like salt, pepper and minced garlic complements venison's natural flavor. Other blends of oil, acidic juices and spices work well too, so don't be afraid to experiment. Allow the venison to marinate for between three and 24 hours.Thaw frozen venison in the refrigerator submerged in marinade to keep the meat moist. Refrigerate the venison until you are ready to smoke it. For ground venison, blend your meat with spices like minced garlic, onions, salt, pepper and paprika. Form the seasoned mixture into patties and refrigerate them until you are ready to smoke them. To smoke venison in a specialty smoker, preheat it to 225 degrees Fahrenheit per the manufacturer's instructions. Large cuts of venison like shoulders or necks require up to eight hours in the smoker, while smaller cuts like sirloin steaks could be done in as little as 30 minutes. No matter the cut, use a food thermometer to periodically check the meat and do not remove it from the smoker until it reaches an internal temperature of 160 degrees F. Allowing the venison to reach this temperature reduces the risk of foodborne illness. Some grills have a built-in smoke box that is designed to be filled with wood chips to smoke food. Cooking venison over a low temperature on your grill with a full smoke box will give it a light smokey flavor similar to venison cooked in a smoker. If your grill does not have a smoker box, you can wrap wood chips in an aluminum foil packet and place it at the back of your grill to function similarly. Either way, soak the wood chips in water for a few minutes before placing them over the heat to produce gradual smoke release. Do not remove the venison from the grill until it reaches a safe temperature of 160 degrees F.
You can serve smoked venison right away or, in some cases, freeze it for later use. For example, you can smoke venison burgers until they reach 160 degrees F, freeze them in a sealed container and then reheat them in an oven later. This is useful for bringing the flavor of smoked venison to the table during times when smoking fresh meat is not convenient. Broken Arrow Ranch: What Is Venison? Why Do We Soak Cucumbers in Water Overnight Prior to Pickling?